It's no secret - teaching history in the elementary classroom can be a struggle. Teachers are faced with the challenge of making people and events of the past relatable to young students who have a hard time even remembering or caring about the events and people of last week, let alone last century! That's why making history come alive in your classroom is so crucial to making students care about what they are learning. But - lucky for you - I love a good challenge! 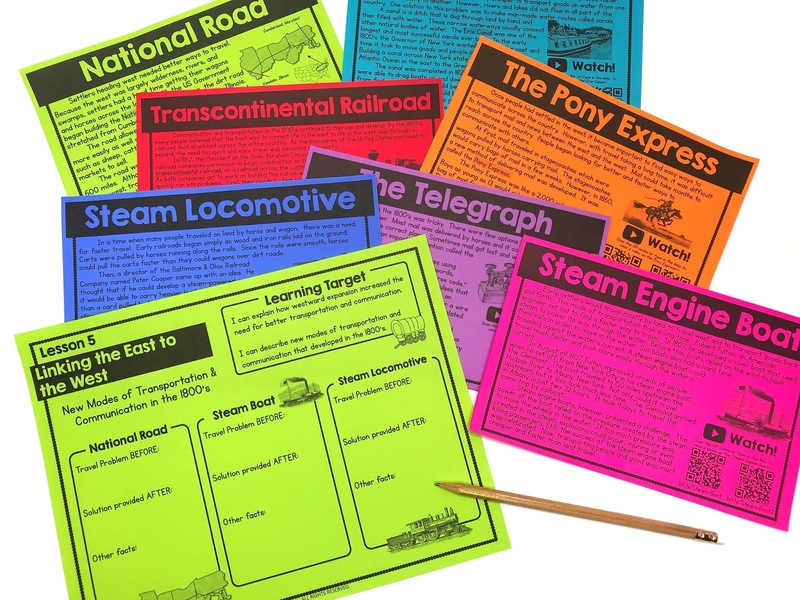 Over the years that I've spent creating social studies units, I've figured out a few ways to help make your instruction more engaging when teaching about the past. I've become a little obsessed with creating reader's theater. I usually include one reader's theater script in each social studies unit that I develop. That's because it's one of the easiest ways to make content normally presented in a textbook appear much more appealing to students. When students act out a specific event in history, they can see themselves there in the action, taking part in the past. I simply take the content represented in a textbook and breathe life into it through dialogue. If there isn't a specific person already connected to the event - I create one! Take the "No Taxation Without Representation" script from above, for example (from my American Revolution unit). 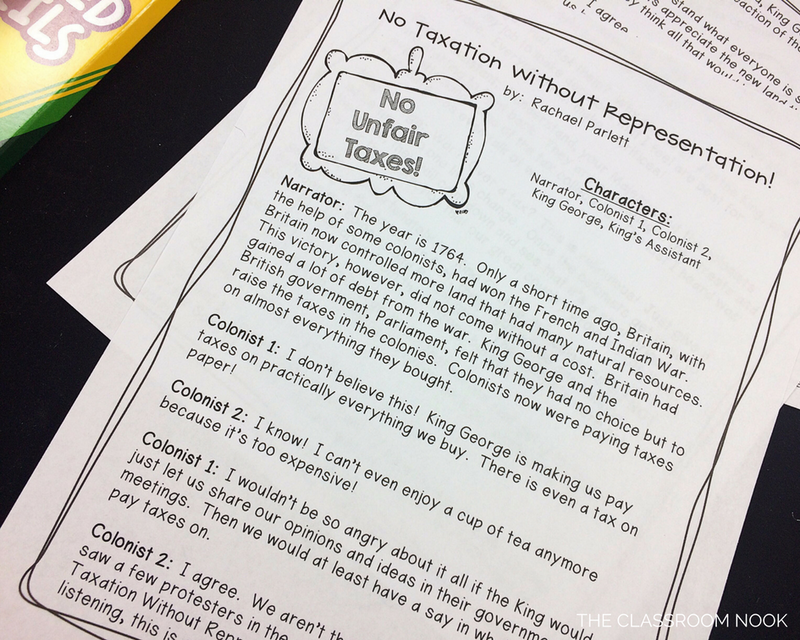 I created a few colonist characters and a narrator to discuss how colonists felt about the unfair taxes being posed by King George of England. In this script, students get to pretend to be angry and fed up (just as the real colonists would have been) toward King George. Had students only read about this event in a textbook, it would have been a snooze-fest! 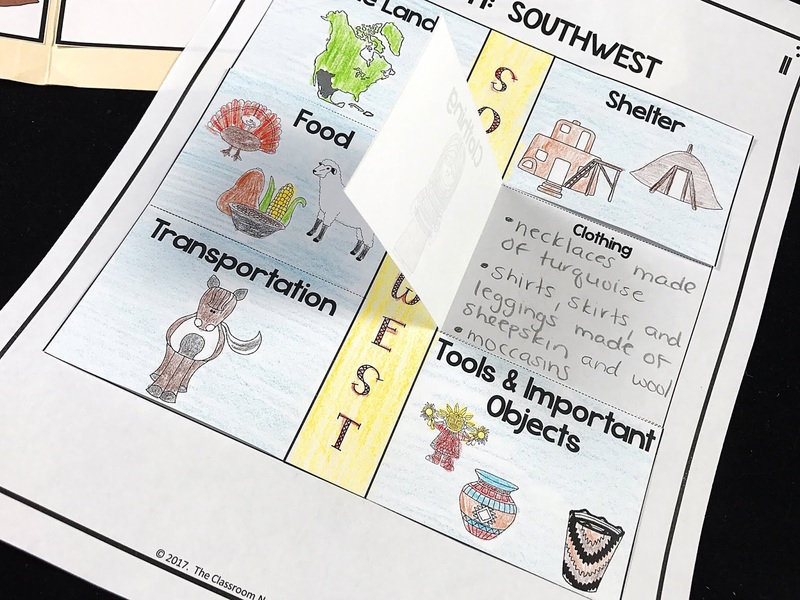 If you're unfamiliar with a gallery walk, here's an overview: A gallery walk is when you set up several sections or stations around your classroom with pictures, artifacts, posters, and other objects about a topic. Each station exhibits something different about that topic. Students walk from station to station collecting information on an activity sheet or notebook. 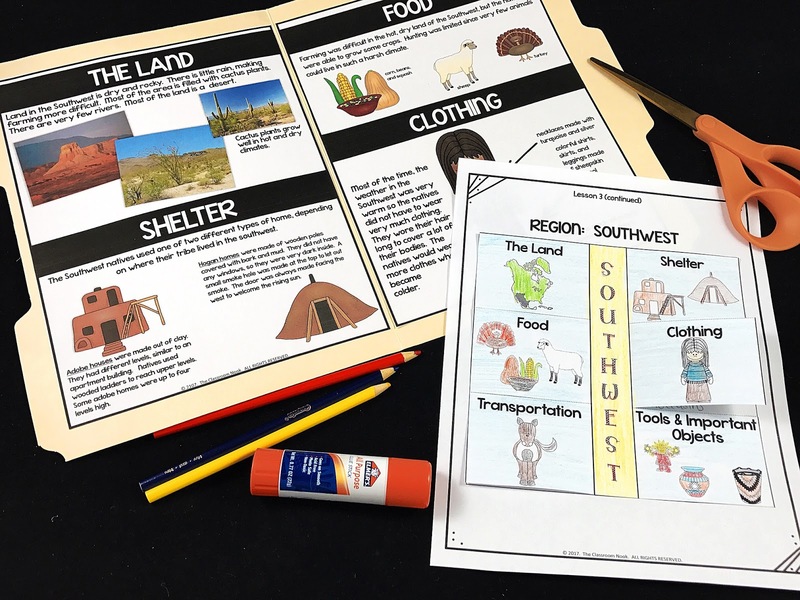 Each station might also have a piece of chart paper near the pictures and objects for students to jot down questions, thoughts, or things that they notice about the content presented at that station. Studies have shown that students retain information better when their bodies are in motion. Help students "walk through history" as they view different posters and objects representing events of the past. In a gallery walk, students can review real photographs (when possible), touch real artifacts and objects, and talk with each other along the way. Again, the information can come directly from your textbook, but a gallery walk allows students to absorb this information in motion! Of course this isn't possible with every topic of history, but when possible - USE IT! Using real photographs vs. clip art has a much stronger impact on a students' retention of a topic. Students love seeing what real people looked like in the past. One of my favorite ways to start a new social studies unit is to have students work in small groups looking through photographs representing that period in history. I have them discuss what they think is going on in each picture and what the people in the photo might be saying. Allowing students to see real pictures from the past help them to visualize a period in history more accurately. This "history-come-alive" strategy may prove a little more challenging, but when possible, it can have a great impact! If you're able to get your hands on old newspapers or real objects used by people in the past, your students' interest level goes way up! Consider inviting experts or historians from different time periods into your classroom that may have access to these objects to share with your students. Take a specific event in history and have students act it out! This strategy worked well when I wanted my students to learn about "The Shot Heard 'Round the World" during our American Revolution unit. Students were assigned a side (minute men vs. British troops) and were armed with a paper ball to fire a shot that began the Battles of Lexington and Concord. Of course you'll want to set up some parameters on behavioral expectations, but students often love acting out a specific event in history! This is different than using a reader's theater because it often requires students to make it up as they go along. They can put their own spin on it and you'll be able to see how well they fully understand the event or time period. Similar to reenacting a specific period in history, create a simulation to help students feel as though they were there. 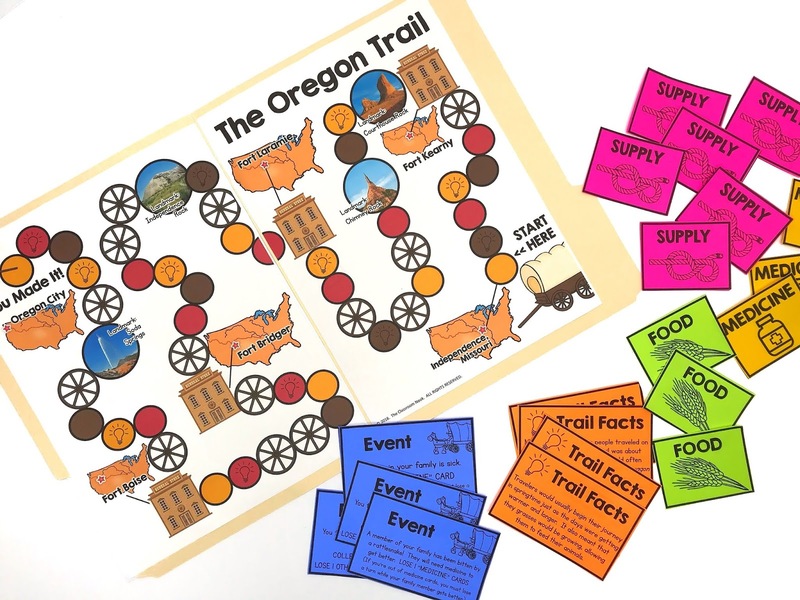 Simulate the process immigrants went through when arriving on Ellis Island or simulate the Salem Witch Trials, or - my favorite - simulate life on the Oregon Trail during westward expansion! This game is part of my Westward Expansion Unit. Students recreate the process that people in history went through in order to better understand the challenges and impact that it had during this time period. I'm obsessed - OBSESSED - with creating Link & Thinks (Not sure what they are? Check out the details HERE and grab a free one!). 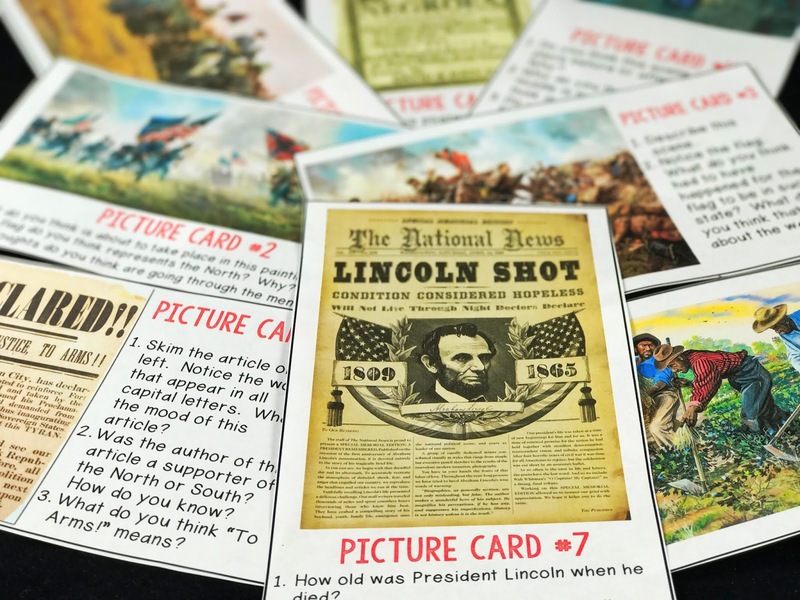 Link & Thinks make it easy for students to experience history through pictures, videos, text, and images - all with a click of a button! I like creating interactive timelines for different wars throughout history (Like these: American Revolution or Civil War), or for highlighting a specific topic like the California Gold Rush, Colonial Jobs, Native American Regions, or the voyages of early European explorers. These Link & Thinks are super engaging and allow students to learn at their own pace. Through Link & Thinks students go back in time and explore events, important people, and places that made a huge impact in history. 8. VIDEOS ON "STUDIES WEEKLY"
21st century learning is visual! With resources like YouTube at our fingertips, it's easier than ever to provide students with videos to enhance learning! A new favorite YouTube channel of mine is Studies Weekly. This channel provides short, kid-friendly video clips that are perfect additions to any social study lesson. 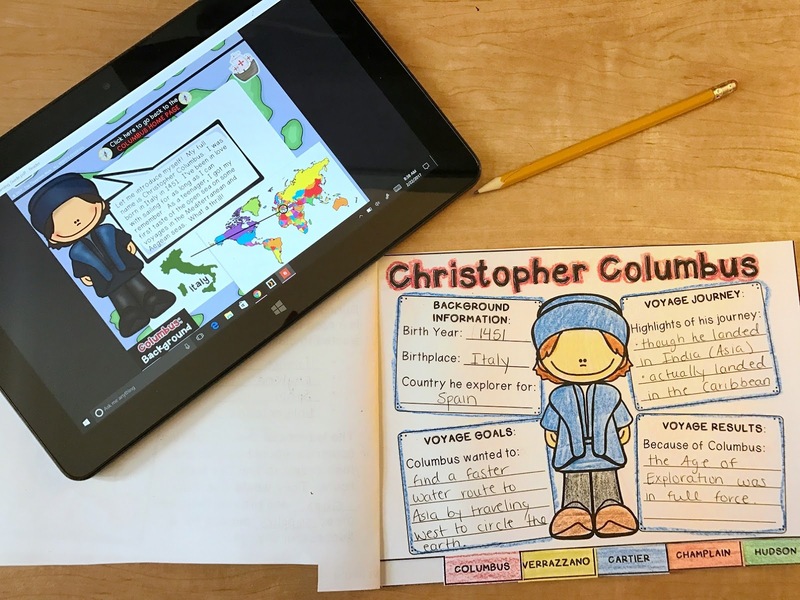 From virtual field trips to places such as The National WWI Museum to stories of building the Transcontinental Railroad, these videos make history come alive! BONUS: Many of the videos are also provided in Spanish. Everyone loves to feel like an expert. Telling students that they will become experts on a certain topic encourages students to take ownership for their learning. If teaching several battles from a specific war period, for example, or teaching new types of transportation and communication in the 1800's, divide students up into small groups and assign them each one portion of the whole topic to learn about and then present to the class. 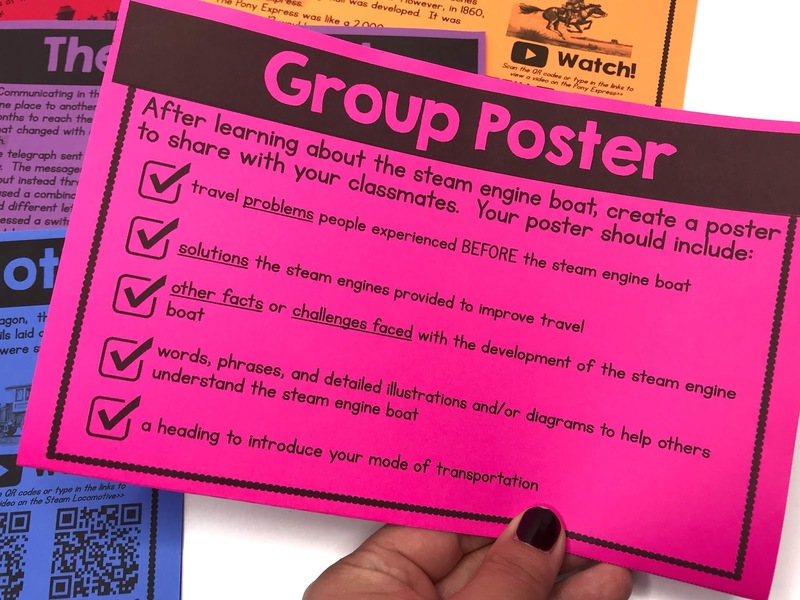 Students can present their learning by creating posters, a PowerPoint presentation, or another type of presentation to the class. But - what if you took that same information (for the most part) and put it in learning folders for students to rotate through in small groups? 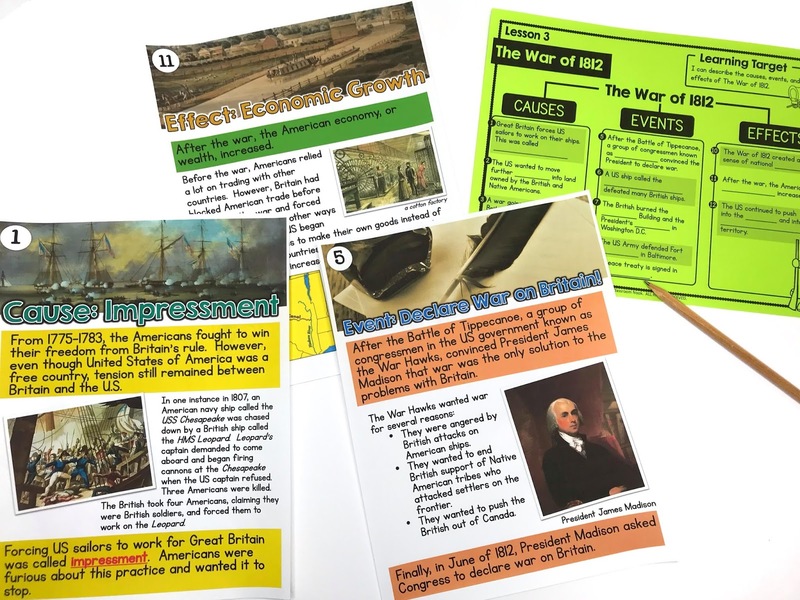 In these groups students read the information together, complete additional activities such as maps, interactive notebook pieces, cut and paste activities, and so on. Now you've got yourself a roomful of students interacting with the information (and each other!) that they are learning. It's one of my favorite ways to present new information to students. You can make your own using a program like PowerPoint, or you can see a collection of my discovery learning folders HERE. You'll find a variety of topics and time periods available! 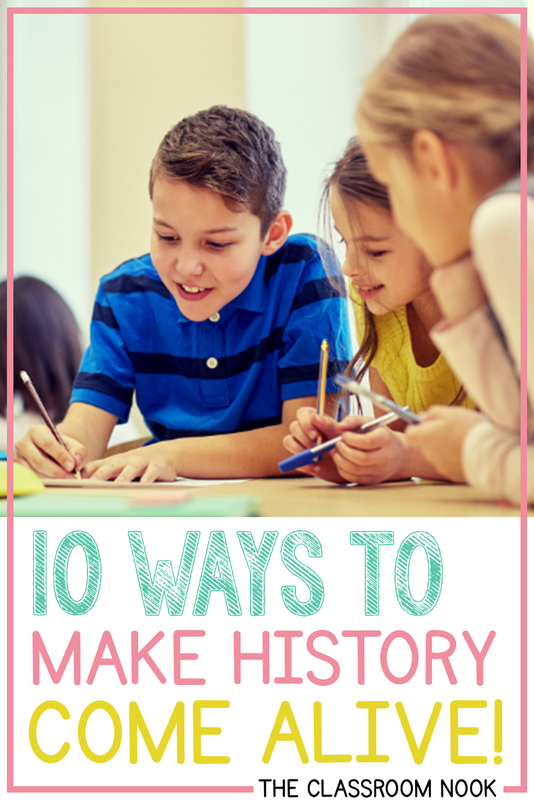 There you have it, 10 ways to make history come alive in your classroom! Which one will you try first?